"How many shares can I buy?" Proper trading money management is the missing link for most unsuccessful traders. This money management calculator solves this problem. 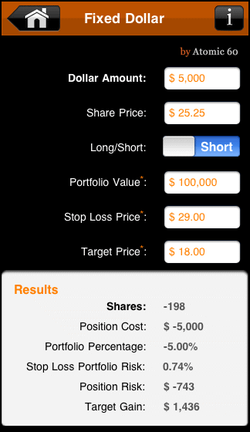 The fixed dollar calculator, calculates the how many shares to buy based on a fixed dollar amount. I have $10,000 to invest. ABC stock is $10.00 per share. I want to go Long. My portfolio is valued at $100,000. Broker comm. is $6.99 per trade. Based on this, I can buy 1,000 shares of ABC. It will cost me $10,007 and comprise 10.01% of my portfolio. 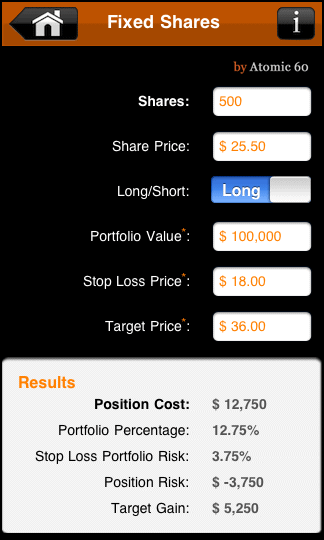 If I set my Stop Price at $7.00, the risk to my overall portfolio is $3,014 which is 1.5% of portfolio value.